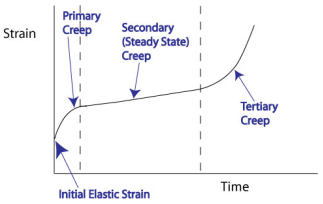 Deformation under a certain applied load over a period of time at a particular temperature is defined as creep, and it limits the load carrying capacity among structual materials. When subjected to a stress greater or equal to its yield stress, the material deforms plastically. Alternately, when the stress is less than its yield stress, the material will deform elastically. Strain rate increases with time and the material is fractured. Increase in creep rate is due to the increasing number of damages such as cavities, cracks and necking. The damaging phenomena reduce the cross-sectional area, which increase the applied stress when placed under constant load. In this experiment, we will study the creep behaviour of a low-melting point metal (Lead, Pb) and a polymer (Polypropylene, PP) at room temperature. Whereby n is the slope of vs lnA at constant temperature. 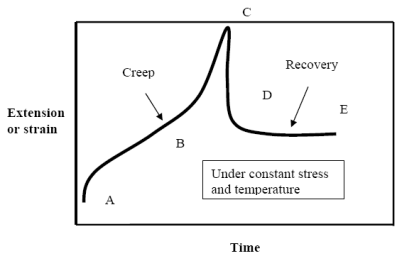 The creep in polymers is almost similar to the creep in metal as it is depends on stress and temperature, with a few exceptions. Comparing Figure 2.2.1 and Figure 2.3.1, the two graphs look similar except that Figure 2.3.1 has a recovery phase, which is termed as the reversal of creep. Possessing viscoelastic properties, the behavior of the material can be predicted using the Kelvin-Voigt model (Figure 2.1.2) as mentioned earlier, and hence, it will be used in this experiment. The data obtained can be plotted into an isochronous graph by taking the constant time section through the creep curves for a specific temperature. And the results obtained formed the isochronous graph. The load was applied steadily to the specimen using the lever principle shown in Figure 3.1.1. Steel pins were used to kept the specimen in place on one side of the lever and the weight hanger on the other. The weight hanger consist of 2 pinning position; the topmost hole was used when the hanger and loads were in rest position while the lower hole was used when the hanger was loaded. If m was the mass of the load on the weight hanger, then the tensile force acting on the specimen can be defined by taking moment about pivot as shown in Figure 3.1.2. The extension of the specimen was measured using a dial gauge (DG). The DG was placed into a tube tightened using a nylon pinch screw to hold the DG in its place. It should be noted that the nylon pinch screw should only be tighten sufficiently to prevent the DG from moving when the loads were placed. The top of the DG was attached to the set up using a grooved plate which was bolted to the lever arm. This arrangement was to ensure the groove in this plate was two times the distance from the pivot to the centre of the specimen. Hence, the extension of the specimen detected by the DG was twice the actual extension of the specimen. And to counter for inaccuracy when zeroing the DG, an additional 3mm was taken into account before the start of the experiment. 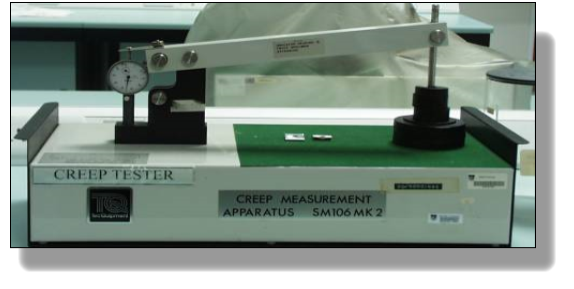 For the measurement of creep in lead, the load applied would be 0.9, 1.0 and 1.1kg. For the measurement of creep in polypropylene, the load applied would be 0.7, 0.8 and 0.9kg. Before conducting the experiment, the width, length, thickness and gauge length of the specimen was measured thrice using an electronic vernier caliper; the readings used for the calculation would be the average reading (highlighted in orange). The lever arm was held in place using 2 pins; 1 of it to be inserted into the bearing block and the other onto the topmost hole of the weight hanger. Attached the specimen onto the set up using 2 pins. Place the Dial Gauge into the hole/tube but do not tighten the nylon screw yet. Attach the groove plate at the top of the Dial Gauge and lever arm and secure it using a thumb nut. Release the pin holding the weight hanger to take up any free movement. Make sure the specimen was placed vertically. Carefully adjust the Dial Gauge until the inner dial reads 3mm and the outer ring reads 0, then tighten the nylon screw. Load the required weight onto the hanger. Raise the loaded weight hanger to the lower hole (loading position) and insert the pin. Gently release the load and start stop watch. Record reading every 15 seconds for 30 minutes or till the specimen ruptures. Place the required load onto the weight hanger. Record the extension for every 15 seconds for specific duration. After the extension period, remove the weights on the weight hanger and continue to record the reading (elastic recovery phase) every 15 seconds for 10 minutes or when the needle on the Dial Gauge stop moving for 1 minute. 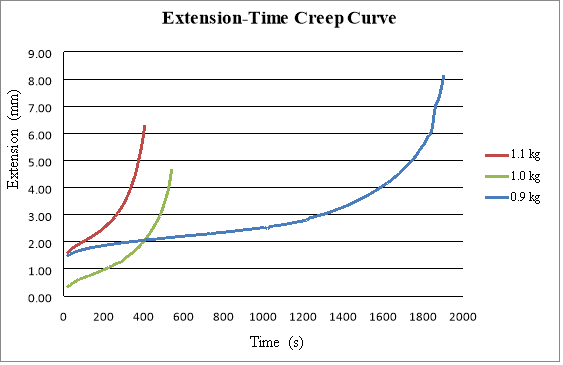 Plot extension vs time curve to show the creep and recovery curve. 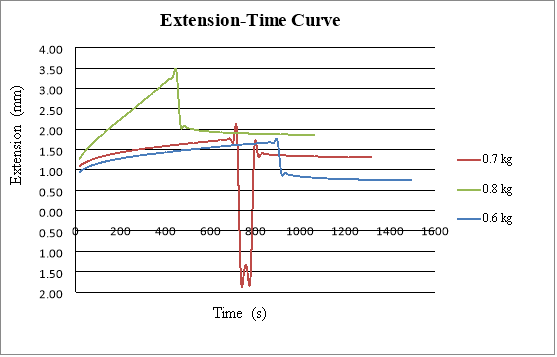 The increment of extension ( ) was selected based on the results reflected on Figure 4.1.1. The creep rate (Î­) of Lead was determine using Equation 3.2.1.1. The stress ( ) applied onto the lead specimen was calculated using Equation 3.2.1.2. Using the data from Table 4.1.1, we can plot a linear graph. 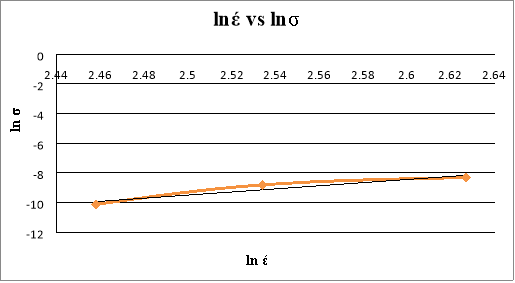 Based on Figure 4.1.2, the stress exponent (n) from the straight line was 10.503. A sudden drop was observed for 0.7kg, this was due to human error as results was not recorded promptly on specific time. 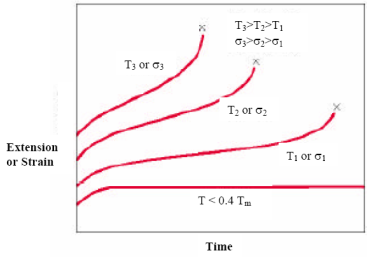 Based on Figure 4.2.1, when stress is constant, the strain increases as time increases, which tallies with the theory. By plotting lnσ against lnÎ­, we can determine the gradient (n) or the stress exponent of the specimen, which correspond to the controlling mechanism of creep under testing conditions. 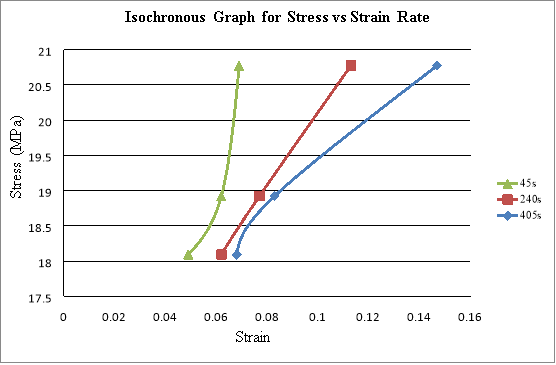 The stress exponent indicates the influence of deformation rate on the mechanical strength of the specimen. At low stresses, n equals to 1, which indicates pure diffusion creep. At high stresses, n > 1, indicating other creeping mechanism besides pure diffusion. The stress exponent for lead in this experiment was found out to be 10.503. And the factors which affects the value is the type of creeping mechanism behind the specimen. Some creeping mechanisms include Coble creep (Grain boundary diffusion) and Dislocation creep/climb (Power law creep). Creep is an important consideration for when a component have to support a load at temperatures where Tabs/TM > 0.4. Materials which exhibits both viscous and elastic property during deformation is known as viscoelasticity. In this experiment, both lead and polypropylene exhibits viscoelasticity to different extend. For lead, the time taken in which the specimen rupture decreases as the stress increases. However, its viscoelasticity is not high hence, its recovery phase is not as significant as polypropylene. Furthermore, the structure of lead is more crystalline than polypropylene, which means it is more brittle and more prone to rupture. Recovery rate is possible on polypropylene specimen because it has higher elasticity due to its amorphous structure. The amorphous structure untangles and lengthens out until it becomes crystalline. In conclusion, the results obtained from the experiment is true to theory. Unfortunately, during the creep test for lead, some results are missing due to some human error resulting in an incomplete graph as depicted in Figure 4.2.1. "Creep Behaviour of Materials." UKEssays.com. 11 2018. All Answers Ltd. 04 2019 <https://www.ukessays.com/essays/physics/creep-behaviour-materials-8183.php?vref=1>. "Creep Behaviour of Materials." All Answers Ltd. ukessays.com, November 2018. Web. 23 April 2019. <https://www.ukessays.com/essays/physics/creep-behaviour-materials-8183.php?vref=1>. UKEssays. November 2018. Creep Behaviour of Materials. [online]. Available from: https://www.ukessays.com/essays/physics/creep-behaviour-materials-8183.php?vref=1 [Accessed 23 April 2019]. UKEssays. Creep Behaviour of Materials [Internet]. November 2018. [Accessed 23 April 2019]; Available from: https://www.ukessays.com/essays/physics/creep-behaviour-materials-8183.php?vref=1.